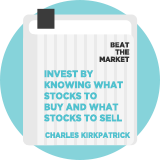 Charles Kirkpatrick Value is a strategy loosely based on the approach of US investment strategist & technician Charles Kirkpatrick, who wrote Beat the Market. It combines relative value, growth and momentum factors and is derived from Kirkpatrick's successful Growth Model. Concerned that growth strategies are susceptible to market downturns, Kirkpatrick devised a value approach that uses the price-to-sales ratio as a risk filter. This interpretation of the screen looks for the cheapest 30% of stocks based on price-to-sales, together with the top 20% of shares with the strongest 130-day Moving Average and then the top 10% with the strongest growth in operating profit. Kirkpatrick wrote: "When I read O'Shaughnessy's book What Works on Wall Street, I discovered from his tests that one way to potentially screen for risks initially was to use the price-to-sales ratio. Unlike O'Shaughnessy, who used the raw figure and set a limit, I used a relative calculation." Can we dig up any performance figures from his book?